Bylakuppe is a Tibetian settlement in Mysore District , Karnataka, India. It was established in 1961. If you feel you need a retreat from a normal hussle and bussle and need to be with silence, with yourself or need to connect to higher self Bylakuppe could be a fine choice. In Bylakuppe there are no street lights. Life comes to a still after 8.00-8.30 pm. Life starts early and stops early. There are no distractions to be found here. 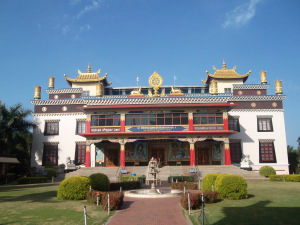 There are various monasteries and nunneries in this area wherein thousands of monks and nuns stay.The monasteries have guest houses inside them wherein you can stay and have a real feel of how the monks stay and can be in touch with them. But, remember the rule of the land talk less and stop external activities for sometime. It is advisable to stay in a monastery guest house. If you are reaching the area late it is advisable to carry a torch with you as it is really pitch dark out there. Food found here is from Tibetian cuisine. Some of the common foods items found here are momos, thukpa and noodles. So , be prepared to have a feel of real Tibetian food. There are very few shops in the area and it is difficult to find food at odd hours , so it is advisable to keep stock of some dry snacks or fruits with you for filling in case you get hungry at odd hours. It is well connected to most of the major cities in South India (e.g. 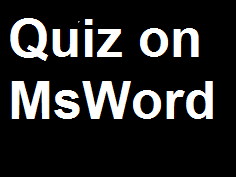 Chennai, Bangalore, Mysore etc.) and is situated on Karnataka State Highway 88. KSRTC bus service is very reliable and safe inside Karnataka. You can board a bus for KushalNagar and get down at the Kushal Nagar bus stand. From there you can hire an auto rickshaw to Bylakuppe which is roughly 7 kms from there. Auto Rickshaw people are reliable. You can reach there by private vehicle as well from Mysore or Bangalore or Chennai etc. Journey is quiet scenic and safe. Mysore Railway station is nearest railway station. 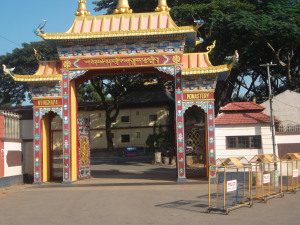 Namdroling Monastry also called as Golden temple. 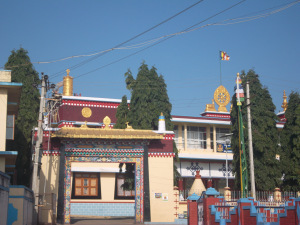 The main temple of this monastery has three gold plated copper statues – one of Lord Buddha , second of Guru Padhmasambhava and Buddha Amitayus. 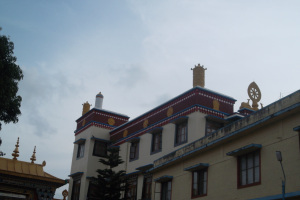 Buddhist monasteries, schools and settlements. Famous buddhist monastries are Sera Jey Monastery, Sakya Monastery and Tashi Lunpho Monastery. Take a stroll of the area. The walk in serene and silent ambience is a worthwhile experience in itself. Run Prayer wheels clockwise .Prayer wheels contain concise prayers and mantras written on them. 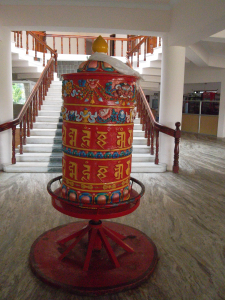 Rotating a prayer wheel is considered equivalent to doing prayers. You can buy various handicrafts in the shops near monasteries. You can buy books on Buddhism and those related to information on the area in the book shops near monasteries. 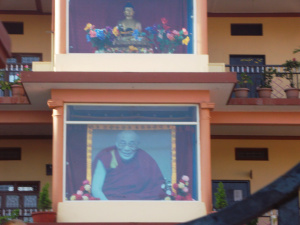 Spiritual Master Dalai Lama mostly visits Bylakuppe in the month of July (around his birthday time) and in the month of December . But, to get reservations during this time is very difficult due to security reasons. Foreign travelers require an entry permit letter for Bylakuppe .They may need to contact concerned authorities for that.